In that old thriller, the assumption was that the melt down of a nuclear reactor would obviate the law of gravity and allow the core of the reactor to go all the way through to China. Today, Chinese folks make it to Venezuela very easily, flying from Paris, no need to go through a radioactive tunnel. On my way back home I was offered the clear opportunity to observe how this illegal traffic of Chinese nationals operates. The plane was full of Chinese. The 747 from Paris carried at least, as far as I could tell, about 50 Chinese who spoke neither Spanish, French nor English. These were not businessman, they looked like workers, peasants, and the like: not a single tie anywhere nor a manicured hand to be seen in that crowd. Many babies by the way. Since there was a delay on take off I had the chance to chit chat with the stewards who learning that I was bi-national asked me point blank how come that so many Chinese where traveling to Caracas and so few to Paris. Makes you wonder, no? During the flight they also told me horror stories about these passengers, from them leaving their soiled papers on the floor of the toilets (they need to go through regularly to clean up before other passengers complain) to their inability to understand basic security measures such as not leaving their bags on emergency doors. And never mind the occasional one hiding in the toilets for a smoke. 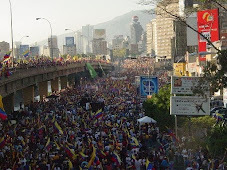 But the best part for me came when I arrived in Caracas. At the airplane exit there was a National Guard in full parade uniform with all sorts of trinkets and a strangely looking Chinese face. All Chinese passengers seemed to be gathering around him as he was collecting from them their passports, all Venezuelan as far as I was able to see (that they hold Venezuelan passports were also confirmed by the flight attendants). I went to stand on my immigration line. As some point I saw all my fellow Chinese traveler follow that "officer" in line and enter though a side door, skipping completely the immigration lines!!!! But the best was yet to come. I had noticed that not all Chinese had been in that welcome wagon group: there were 3 behind me. When the immigration officer started checking my passport I noticed that what appeared to be a superior got close to her and told her something discretely pointing out to the Chinese behind me. But I was able to listen as he said that "they can go through without problem, their papers are all OK" without me having ever seen him come and check them.... The woman did realize that I had heard the order and she started mumbling to the effect of letting me know that one thing is what she was told another that the papers of these people were legal. I was tempted to tell her not to worry, that I knew very well she would let them through and that I was not going to make a fuss for her and for me. Now, we have long known that there is indeed a traffic of human beings going on in the word, that poor provincial Chinese that are beyond help from Beijing are simply shipped away as a modern equivalent of slave work. Much more easier for China to pay for their one way ticket out, and probably what they wish they could do with, say, all Tibetans. If you doubt it you can just type the following key word in Google: visas ilegales china. You will get 121 000 entries. The very first one will be an account of the workings of a Chinese Mafia in Costa Rica, with threats and amounts involved. I had seen such arrival of Chinese in the past and many of my friends who travel have told me similar tales. What was surprising this time is the boldness in which this human trafficking is now taking place in Venezuela. Just amazing! I suppose that in addition of paying for the shipment of our oil to China at the rate of 12 USD per barrel (which we would save by continuing our sales to the US), we will also accept China to pay us out from its human misery and slave labor that risks to become even more of an intractable problem now that the US will lower its imports from China. So there we are, the Bolivarian revolution covering up for this modern slave labor traffic. Unbelievable! Note: before any one reads any racist connotation to this post. I have no problem with this Chinese immigration. They are likely to be hard workers, willing to escape the desperate misery and slave condition that they suffer in China. These people can be perfectly well integrated in a couple of generations as they do not carry baggage such a ridiculous religious obligations. However we should call it for what it is: modern XXI century slavery promoted at at the very least tolerated by the pseudo socialist regime of Chavez. Then again slave camps were common in the Soviet Union and Cuba, were they not?